Dr. Nachnani is a graduate of the Internal Medicine residency program at Michigan State University/Synergy Medical Education Alliance. He was selected chief resident of his program in 2003 and graduated his residency program in 2004. He is board certified in Internal Medicine having graduated in the top 10th docile of the American Board of Internal Medicine exams. His practice encompasses all aspects of primary care and he serves as primary care physician for his patients. His special interest is high blood pressure management and he is the only American Society of Hypertension certified specialist in Sumner County. 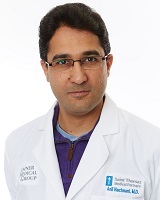 Dr. Nachnani, his wife and three children live in Nashville. He enjoys tennis, wine tasting and outdoor activities in his spare time. He is currently accepting new patients.